While this isn’t fine woodworking, it is mostly constructed out of wood. I’ve been involved with my kids and their High School drama productions. This year’s musical was Disney’s “Newsies”, and I was in charge of the set design and construction. The main set pieces were three 10’ wide x 10’ deep x 22.5’ tall towers. We used metal stage trusses as the main supports and the rest was 2×4 and 2×6 platforms and 2×10s for the stair cases. There was a total of twelve platforms and twelve staircases on the three towers. Everything was built on jigs so that the kids could build it fast and so it would all fit together. Each tower rolls on 12 heavy duty casters and are moved with a 440lb electric cable hoist. And finally, each of the three openings in the front of the towers has an electric powered screen that rolls up and down. You can see the towers in action here. Other pieces built for this show include a vintage “bellows” camera out of cherry, 48” diameter wagon wheels from 3/4” plywood and some old stair spindles for our newspaper cart, “Pulitzer’s” desk (our painting crew made it look like cherry), a pair of 10’ tall doors that fly in on cables, and a pair of 4’ x 12’ x 10’ two level rolling carts. Now that this is all over, I can get back to making sawdust in my own shop! wow jim what was this hollywood high,pretty elaborate sets for a high school play.very impressive,that had to be fun,and a lot of work.thanks for sharing this. Jim, that is quite the production. I agree with Pottz, it is way beyond the budgets we had in my kids schools. Wow that is a lot of wood. How did you keep track of all of it? What a great project for a great musical!! Jack Kelly and Spot Conlon!! While we do have a decent budget, the program is self supporting with typically 7 or 8 shows at $17 a ticket x 900 seats. 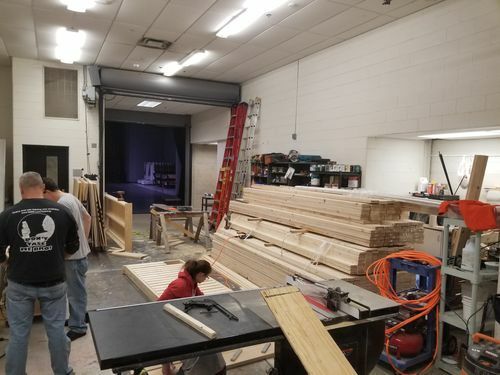 We were actually able to get the school board to buy a new sawstop table saw when they saw how unsafe the old contractor saw was. Hardest part was working with new kids and parents each week. The easy part was that the towers were all identical, so once the jigs were set up and we figured out how to put them together, assembly was pretty easy to manage. Jim – how did you mount the wheels to the newspaper cart? We used a 1 1/2” pipe for an axle. One wheel has a pipe flange mounted to it, and the other wheel has a hole and a cap threaded on to the pipe. Some PVC spacers position the wheels left and right.